If you want to bet on sports and are wondering which sportsbook to pick, we can help you because we review the top betting sites. Our sportsbook reviews and sports betting tips are written by wagering experts, intimately familiar with rating Las Vegas as well as the most popular online betting sites. Site ratings are measured by player satisfaction, speed of payouts, and quality and quickness of lines, listings and a comprehensive point spreads review. At these betting sites we have analyzed and reviewed, you can bet on Football, Basketball, Soccer, and many other sporting events worldwide, from the comfort of your home 24 hours a day. Invest some time and read what we have to tell you. We believe that learning the inner workings and differences between the best betting sites on the internet by analyzing our site reviews of sportsbooks pays off hugely. Why? Because this gives you excellent reasons and solid facts upon which to base your decision of what online sportsbook to join and which Vegas location to visit. Casablanca Gaming owns this longtime sportsbook, known for both their longevity and their excellence in off-shore gaming. 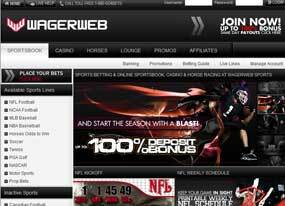 Based out of Costa Rica, WagerWeb was a pioneer in the online gaming industry. With a long and storied history, they are a great place to start for sportsbook fun. They have over $100 million dollars in bets in their rear view mirror. Bovada is one of the most popular online sportsbooks around for United States bettors and has been around for a good while. Bovada.lv has only been around since December of 2011, but their former urls including bodog.com and bodog.eu have been around much longer. Owner Calvin Ayre has been around the business for decades and owns Bovada. Offering a very nice 50% for each opening deposit, 5 Dimes is a very popular destination in online sportsbooks. They have multiple options to keep the betting fresh and they also have one of the kindest interfaces in the industry on their website. Every player that goes to 5 Dimes walks away happy with the experience. They often return for more. Betonline.com is one of the few online sportsbooks that has kept a great reputation in this difficult world of online bettors. The primary reasons for this are due to an immaculate reputation for paying out on time and without hassles. They also offer fantastic bonuses to the online bettor, making their website one of the first destinations for American players. Topbet.com is another no frills type of sportsbook and they truly believe in focusing on what really matters; betting and payouts. TopBet is one of the quickest to pay out in the industry and they do so without any hassles. The best thing about TopBet is that they are easy to work with. The website is clean and easy to understand for even the beginning bettor. Bookmaker.eu is quite simply the gold standard in this industry. They are rock solid in their financials and the way they process their customer’s bets and they offer a rewards program that is second to none. This awesome sportsbook has the best reputation and would be among the first to get our referrals. They also offer tons of bonuses. Betdsi.eu is the result of former powerhouse Diamond Sports International and Bookmaker getting together. The merger has resulted in one of the most respected and popular online gaming sites around. With VIP customer service and online chat, flexible games and betting options and a huge dose of respect in the industry, DSI is sure to be a player in the world of online betting for the long haul. Justbet.cx has been one of the best offshore gaming companies in the industry for quite some time. JustBet is actually one of the sportsbooks that focuses primarily on the bonuses and less on the bells and whistles. They offer quick deposits, low fees and plenty of bonuses to entice even the most discriminating of bettors. Vietbet.com is known for having some of the most Vegas-rich graphics and interfaces on the web. If you are a huge casino fan and like to play in that type of atmosphere, then Vietbet.com is the one for you. They also are popular because they are secure and safe. The software for this site is top in the industry. Bet365.com is the place to go whether you are a recreational bettor or player or a longtime professional. They have plenty of options that include bingo, casino games, sports betting, and even lottery. If you want a dependable company that is Gaming Commission licensed, then Bet365.com is for you. Intertops.com is one of the oldest and most trusted online sportsbooks that are out there. They rank very highly in every phase of online betting, including customer service, bonuses, ease of deposits and payouts and reputation for security. Intertops.com is run by Intertops Proprietary and is based in Antigua. When it comes to football, no other site is better than oddsmaker.ag. This place has oceans of information to make educated wagers and the community loves to talk. If you enjoy placing football bets, this is your hot spot. Also, the company is very highly rated where it counts. They payout on time and have outstanding customer service. Sportbet.com is run by 5Dimes group out of Costa Rica and they know how to treat customers. Their awesome customer service keeps people coming back and their extensive bonus structure keeps them playing. Though the company has been operating since 1997, they still put their customers first and know what is needed to bet online successfully. Sportsinteraction.com is based out of Canada and no longer accepts United States players. For other countries they are very popular, however. They have been around since 1997 and they are known for having one of the easiest systems to understand and learn. If you are new to the betting game, then Sportsinteraction.com is a good place to start. Sportsbook.ag is known for having the best basketball lines and offers tons of options to the online bettor. They offer up tons of bonus money annually and also offer a fantastic March Madness Bracket pool every season. They have been around since 1996 and you can get in with a minimal deposit of $20. Plenty of fun can be found here. Jazzsports.com has spent plenty of time in the sportsbook business. They have been around since 1996 and offer same day payouts, great customer service and loads of options and sports to choose from. Everything from horse racing to football is covered here and they also have an outstanding casino. Jazzsports.com is a great option for the new or old bettor. Betus.com.pa offers a number of enticing things on their website. They offer easy deposit and sign up as well as bonuses. They also offer fast payouts and multiple options. Their casino offers over fifty games and the online sports betting system is very user friendly. They seem to really focus on horseracing as well. A great well rounded sportsbook. Betphoenix.com is a growing sportsbook that claims to be willing to take a bet on anything. They offer sportsbook action, casino action and racing action all in one place. They do have bonuses and various rewards programs but seem to be more focused on the games and the interface. They also offer timely payouts. Skybook.com is a solid sportsbook that offers all the things you need to bet online. Great customer service, quick payouts and also a live online casino are available to supplement the sports betting. They also offer a free half point when you bet making your odds just a little bit better. Every edge you can get is a good thing. Willhill has a Sportsbook Review Rating of A and with good reason. Based out of the UK, Willhill.com offers great customer service and plenty of options to the online bettor. They also offer a 100% initial deposit bonus with certain codes found easily online. Wagering has never been so easy. Unibet.co.uk is a very diverse online sportsbook that offers live betting, mobile betting, poker and casino games, tournaments and skill games all in one place. Based in the UK, they offer plenty of awesome options to deposit and payout, as well as bonuses to get you started in style. Unibet.co.uk is about as solid a sportsbook as it gets. Ladbrokes is based out of the UK and they have been around in some form since the 1950s. They began online in 2000 and have quickly established a solid following for being dependable and trustworthy. They are also able to accept Paypal payments making them one of the few that feature such an option. Ladbrokes is a solid sportsbook service. bwin.com is not the longest standing sportsbook but they have gained a reputation for being dependable. They offer all the things a typical sportsbook would plus plenty of information to help you bet responsibly. The website actually offers advice about how to keep from overdoing it which is becoming rare in the industry. A fairly interesting sportsbook in that the interface appears very clean and smooth. Not much information is out there about it, but it appears to be a solid choice for online bettors. They offer an online casino, poker and sportsbetting for all sports. They even offer a Bingo game for those that are so inclined. BETFRED.com is the sponsor of the annual World Snooker Championships and offers a great online betting experience. Based in the UK, they offer all the things you would be looking for in a betting situation. They also offer tons of great bonuses to entice the online player. Their customer service is supposed to be the top of the line as well. PaddyPower.com is based in Ireland and prides itself on being the most secure online booker around. They also operate a huge chain of retail stores and know a thing or two about service. They are highly innovative with their platform and constantly upgrade their betting experience. Service at PaddyPower.com is second to none. BetVictor.com is an offshoot of the ever-popular Victor Chandler group of websites. Chandler has been in the business as a family for over sixty years and is commonly referred to as “The Gentleman Bookmaker” in betting circles. They offer betting on everything from football to snooker and the service is exquisite. Pinnaclesports.com is certainly one of the most respected online betting sites, but they go about it in a slightly different manner. They are known for having the best possible pricing and lines rather than focusing on bonuses and quick draw type tactics. This has worked over the years as savvy bettors have learned to place value where it belongs. Bonuses are useless unless you have a decent shot at payout. Pinnacle seems to understand that in a unique way. Zeno’s Pub: State College, Penn. The War Eagle Supper Club: Auburn, Ala.
Fraser’s Pub: Ann Arbor, Mich.
Sam Hughes Place Championship Dining: Tucson, Ariz. The Swamp Restaurant: Gainesville, Fla.
Walk-Ons Bistreaux & Bar: Baton Rouge, La. The Bear’s Lair Pub: Berkeley, Calif.
A.J.’s Sports Bar: Tallahassee, Fla.
O’Connell’s Irish Pub & Grille: Norman, Okla.
Nick’s English Hut: Bloomington, Ind. Three Dollar Café: Atlanta, Ga.
ESPN Zone: Los Angeles, Calif.
Game Day Pub: Athens, Ga.
Sandbar Sports Grill: Coconut Grove, Fla.
O’Kelly’s Sports Bar & Grill: Mount Pleasant, Mich.
Taylor’s Bar and Grill: Eugene, Ore.
Rusty’s Last Chance Saloon: Manhattan, Kan.
Ricky’s Sports Theatre & Grill: San Leandro, Calif.
Devils’ Advocate Bar & Grill: Tempe, Ariz.
Jerome Bettis’ Grille 36: Pittsburgh, Penn. The Four’s Restaurant and Sports Bar: Boston, Mass. Jack and Dan’s: Spokane, Wash.
Big Al’s Grille & Sports Bar: Blacksburg, Va. Bent Willey’s: Morgantown, W. Va.
State Street Brats: Madison, Wisc. Trippers Sports Bar: Lansing, Mich.
Brewsky’s Food & Spirits: Lincoln, Neb. Between the Buns: South Bend, Ind. The Gaslamp Tavern: San Diego, Calif.
Caesars Palace Sports Book: Las Vegas, Nev.
Sportsbook review pages can help you find the best bookies online for all of your gambling needs. There are many different sites available all claiming to be the best so it’s hard to choose one without doing your research first. You need a lot of information about the different sportsbook sites before you pick one. Reviews can help you make a good decision, provided they have the right information. One of the first things a good review will cover is whether the site is reliable and safe to use. A lot of money can exchange hands when sports betting so you cannot be too careful. They will also cover betting options, limits, payout options, bonuses and the type of software they use. All of this information is useful in helping you decide which site is for you but you need to know that you can trust the review you’re using to provide you with accurate information. An unbiased opinion– In order to get a true picture of what a sportsbook site is like, the review pages should be written by someone in a neutral position providing a fair but honest review. Reviews written by someone who benefits if you choose a certain site tend to favor that site and build it up more than they should. Writers who have nothing to gain if you choose the site in the review will normally give their unbiased opinion. An accurate financial risk assessment– The financial risk of any sportsbook site should be included in review pages. With the amount of money that can exchange hands, it’s vital that you’re dealing with a stable company you can trust. Feedback from players– An excellent sportsbook review page will include feedback that real players provide based on their personal experience whether it’s good or bad. Some reviews tend to screen out the bad feedback and only show the good. In order to get a clear picture of what the site is really like, you need both the good and bad so you can form your own opinion. The site you use will have a lot to do with the type of betting experience you have. If it’s a good site that offers plenty of options and important betting information, then you’re sure to have a good experience. However, if the site you choose is not reliable or financially stable, it could turn into a negative experience. Reviews are designed to give you a good idea of what to expect when dealing with a particular site. You should still do your own research and double check things for yourself before using a site just to make sure it is the right one for you. However, reviews can get you off to a great start and help you narrow down the options before you begin checking them out for yourself. This will save you a lot of time and help you find the one you want to use much faster.